Rairaiken is well-known for its old-fashioned steamy bowl of ramen and tag as “Japan’s Famous Ramen!” ™ – Thus, a unique process of preparing the Broth soup and Proprietary recipe of Sauces and Freshly-made Noodles that makes every bowlful of Ramen a heartwarming experience! Rairaiken offers authentic Japanese foods that went through Product research. Chef Benjie Garcia, the owner heads the RND, ensuring customers of delightfully appetizing foods that are truly Japanese! 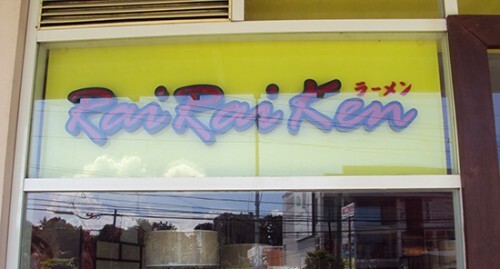 Rai Rai Ken has expanded its menu to include all time favorite Rai Rai Ken Bento which is an artful and delightful concoction of chicken tori karaage, ebi tempura, beef yakiniku, fried gyoza, yasai salad, tamago and miso soup. For those who love ramen, Rai Rai Ken’s Seafoods Hotpot Ramen, which is a combination of mixed seafoods, fish cakes, crab stick, mussels and tofu in thick soup. A must try in the menu are fresh sushi, sashimi, and other concoctions prepared by expert sushi chef (all trained by a Japanese chef) will surely delight you. note: Add Php 20 for regular iced tea or red iced tea. For more menu details, visit Rai Rai Ken’s official website’s menu gallery.